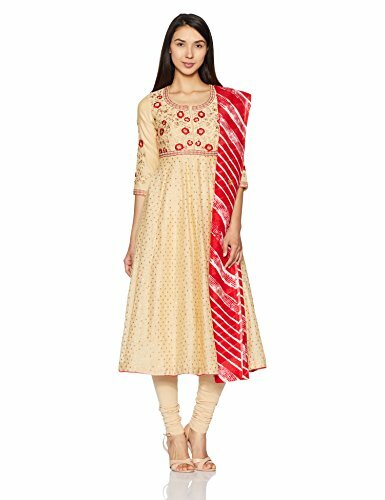 Look dashing in this beige Anarkali and grab all eyeballs. The brocade kurta with embroidered yoke look exotic and makes an ideal style for special evening occasions. Its matching churidar and contrast red dupatta make it a contemporary pick and will ensure you stay out of the box while attending any gathering or formal function. Combine it with red clutch and pumps. Dry Clean Only,cool Iron On Reverse Of Garment.